I don’t know what took me so long to read this new book by one of my favorite authors and illustrators, G. Brian Karas. I look forward to every book Karas publishes and always feel a “here’s another one” anticipation when I see a new title. As it turns out, my wait was perfectly timed. The Village Garage is about a group of workers at a town garage – the workers who clean up the leaves, fill the pot holes, mow the town’s grass and, of course, plow the snow. Well – as luck would have it – I looked at this book during a big snowstorm so there were sound effects! “Chink Chink Chink, the chains rattle. And that’s exactly what I heard as I turned the pages of this wonderful book. One of the things I particularly like about The Village Garage is that it’s about a community, and especially the people who make a community work. Everyone in this garage looks so friendly, and as you will see, commited to picking up every leaf! The story is about a boy named Jack who is invited to the princess’s tenth birthday party. The problem is that Jack has no money for a gift. 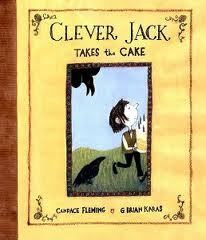 As the title tells us, though, Jack is clever and he decides to bake a cake for the princess. As Jack walks through the woods on his way to the party, I was reminded of Irene’s journey in William Steig’s classic book, Brave Irene (another one of my favorite books). The two books complement each other perfectly and are nice springboards to discussions about character and the value of resourcefulness. When you see this book, make sure you begin with the endpapers. This delightful story begins there. Possible Caldecott winner? I just checked a few on-line lists of the U.S.A.’s windiest cities, and Boston was, not surprisingly, on each of them. Not Chicago, “the windy city,” but Boston, and special mention was even given to a part of Boston called Blue Hill which is not too far from where I live. None of this surprised me at all. Living and working near the ocean has its pleasures to be sure, but the wind can be a bit relentless at times. Every March, along with the St. Patrick’s Day books (this is Boston! 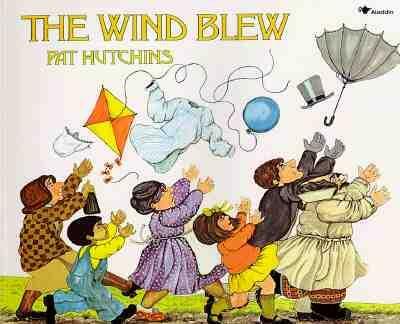 ), I display picture books about windy days. Today, there was good news and bad news on the windy books front. The good news is that I read on Amazon about a new book, Flora’s Very Windy Day, which is being published in August. It promises to be excellent given that its author is Jeanne Birdsall (The Penderwicks) and it’s illustrated by an artist from whom I would buy his illustrated grocery list, Matt Phelan (The Storm in the Barn). Of course, this one went right into the shopping basket.